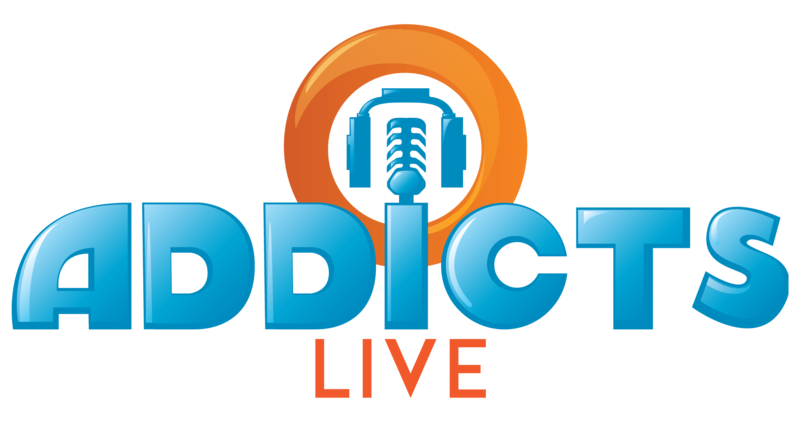 Welcome to another edition of From the Mouths of Addicts, where YOU get to sound off on anything and everything in the world of Tapped Out! This week’s post comes to us from one of our frequent commenters and guest blogger…Happy Tapper! Hello fellow tappers. My name is HappyTapper or Sam and I want to start this post by saying … I don’t like Halloween. I’m WAY more of a Christmas lad. Even though we got a pretty naff Halloween event, I’m crossing my fingers for a truly fun Christmas event so that I forget “The Event to Not be Named” (Xmas 2016). As soon as I knew Halloween was getting quite repetitive and boring, I started to plan my perfect Christmas in TSTO because I’m sad, have no life and have nothing better to do then rewatch Simpsons episodes and organise an event that I know won’t even have an impact. 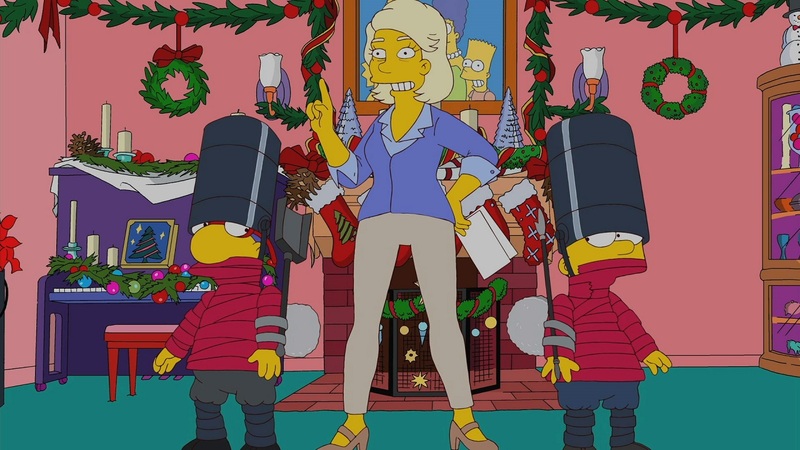 When I thought about Christmas in the game I got quite worried because I really couldn’t think of much left to add because there aren’t a lot of Christmas episodes to pull from and the Christmas episodes that they have normally stay local to “normal” Springfield so don’t have much Christmas content for the game. BUT after some Christmas episode rewatching I had an idea for a Christmas event that pulled together bits and bobs of Festive content that I’d really like in the game. TSTO Winter wouldn’t be Winter without snow so I doubt EA would do an update without snow but I want to see snow be a bigger part of the season with snow fighting, snow forts, more snow sculptures and snow tiles so we can have parts of the town in permanent winter when the season ends! I think some sort of Snow Fighting feature would be REALLY cool. 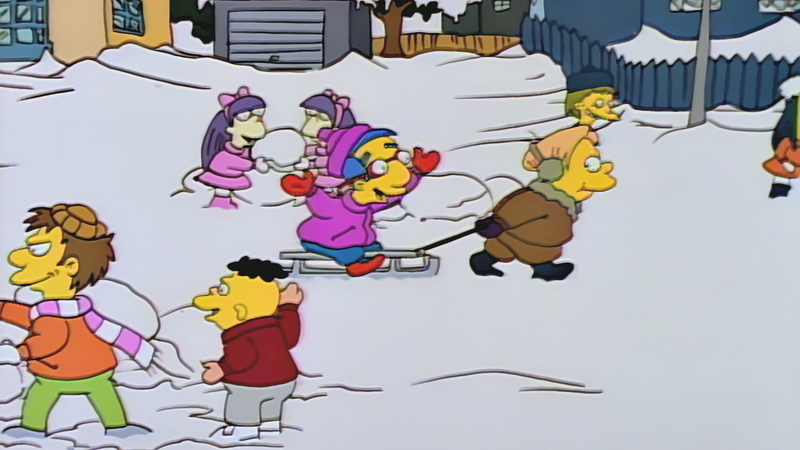 Maybe you have to choose whether you want to be on Lisa’s or Bart’s team and it would be a mini-game (maybe some variation of the many Battle minigames we’ve had) where we can win snow forts, snow outfits for people and more cool prizes whilst earning event currency at the same time. Night Mode and Christmas Lights! I don’t know one tapper which wouldn’t love a night mode! And Christmas seems like the perfect time to introduce this awesome feature – how else can Christmas lights shine? Maybe we can get some Christmas decorating/Christmas Light competition where we see our towns plunged into darkness from specific times to parallel darkness of individual time zones. If you’re not totally hooked on Night Mode then a quick skim of this awesome post with edited photos by the amazing ToxicShark will soon change your mind. The Polar Express is quite an iconic Christmas film so it’s no surprise that the Simpsons made a little reference to it in the first segment from “The Fight before Christmas”. I know we have the North Pole Station in our games but it’s really not the same as having an actual Christmas train with actual tracks. If EA managed to make a monorail system, how hard would it be to make a Train station with The Cold Train – EA changed a bit of dialogue from The Polar Express to The Cold Train showing that they wouldn’t be able to name it after the original. This idea just seems to write itself for the TSTO team. I mean, how hard can it be to put together a screen with doors and a gift (whether it be event currency, donuts or items for the game) and have us open a door each day. I think it would be awesome and a way to encourage players to log in daily. 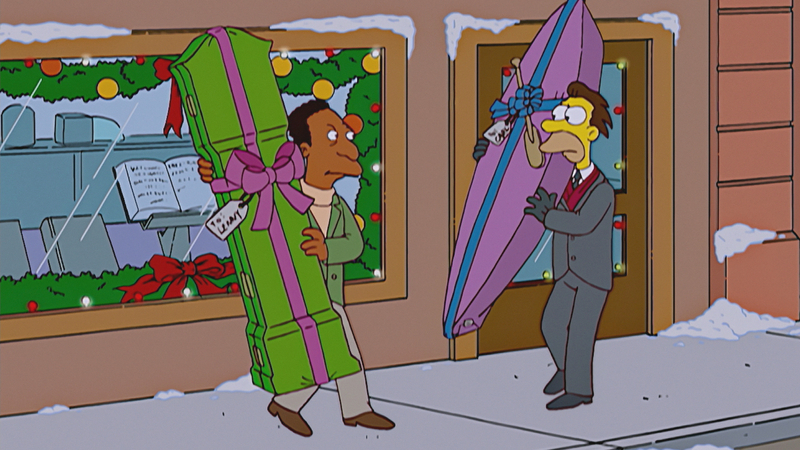 There have been many occasions where I’ve wanted to pay back my TSTO friends and I think introducing a Neighbor Gift Giving system would be awesome, totally seasonal and encourage a more selfless side to the season. It could be with donuts, extra in-game cash, inventory items or all of the above because I’m sure that there are many items that would stay in my inventory that I’m sure some of my neighbors would love. Neighbor interaction really is a missing part of TSTO at the moment so whether it be with Gift Giving or being able to drop of stuff or have more interaction with our neighbor-eenos, Neighbor interaction just seems right for the season of family, community and love. I can’t emphasis how much I’d appreciate this feature, especially since it would feel so nice to plan out which personal item I’d give to my TOuk Friends on Christmas day to parallel gift opening on the 25th. It wouldn’t be the Festive Season if Gil didn’t pop up to persuade us to spend some doughy goods on whatever he has to offer and since Gil has featured in a Christmas episode, I’m sure Gil would like to have a permanent home in our games for the Winter season. I really like the character of Gil and some of the episodes he’s been in so to see him pop up once in every major event just to disappear is a shame. 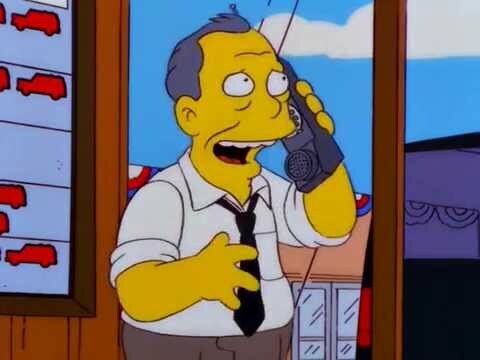 I really want Gil as a permanent, fully playable character that could still introduce Gil Deals. How could he be introduced?… Well, we could see him wonder around town with his speech bubble, but this time, with a Gil icon. This could be followed by some funny dialogue that Gil has nothing else to sell and needs money for the chilly season so is willing to sell himself. Place a hefty price tag round his neck, throw in a Santa Gil costume freebie and BISH BASH BOSH you have a Gil Deal, the addition a classic character and a comical introduction! I’d love for EA to sprinkle some little Easter Eggs (hiding items, fun, dialogue etc.) around our towns for us to find this Christmas. Grinch Burns (see my Final Idea) could take one of Santa’s Sacks and hide some presents around town and every now and then gives little clues for us to find these items when we tap on specific buildings, make certain Characters do certain tasks etc. It would be a really fun and interactive way to throw in some leftover Christmas content that EA want to add! I mentioned the theme of Family briefly above and I think a whole Bringing the Family together for Winter would be a great theme for Christmas since we have many Family members that have been wanted from the tappers for a while. 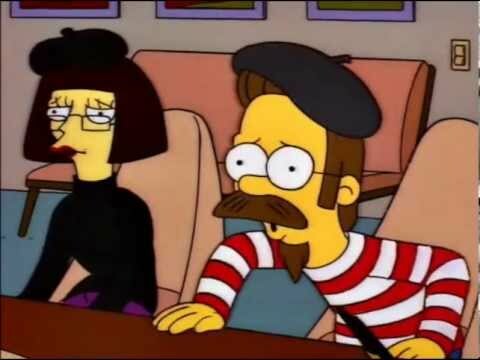 I’d LOVE for Sarah Wiggum to come into the game soon and other family members to be included could be Agnes and Nedsel Flanders (parents to Ned that always change look throughout the show! ), Grandma Van Houten, Annika Van Houten, Eddie Muntz and Martin Prince, Sr and Martha Prince to name a few missing family members. And a costume that I’ve wanted for AGES now is an Alive Maude costume that should just be called “Maude” so that I can use Maude as her normal skin and the ghost version as a costume. Rodd and Todd need a mother that isn’t constantly haunting the town! If you watch “The Fight Before Christmas” episode there are many blink and you miss them items that I’m sure would make fun content for the game. I’d quite like to some Toy Soldiers NPCs, a Santa’s Helper Moe costume, maybe some Toy Conveyor Belts, North Pole Milhouse, North Pole Nelson and other elves from the North Pole segment. 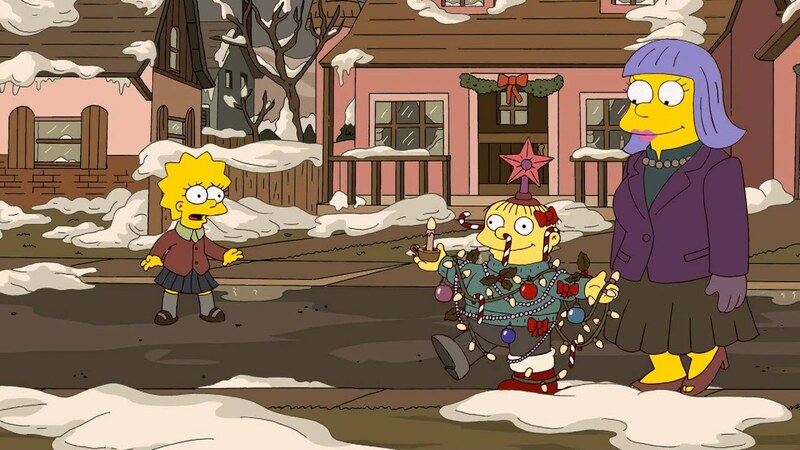 From Lisa’s Dream the one costume I would really like is Christmas Tree Ralph because even though he has a short cameo, it’s just funny and true to the character of Ralph. And there’s not much from the Martha Stewart segment apart from Martha Stewart herself and Toy Soldier Bart and Milhouse but these seem silly and pointless costumes to have. Going back to random content, I’d love an Outdoor Skating rink where we could see characters skate around. Another item that I’d quite like is an Outside Piano as a piano is often seen in so many episodes of the show and has been featured in many Christmas scenes. 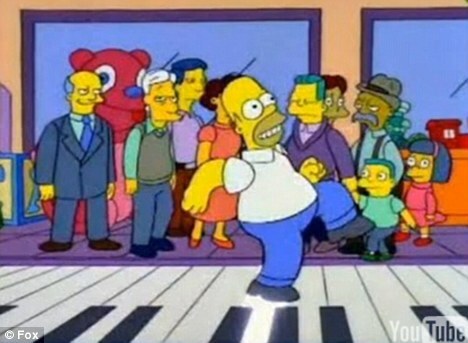 Grandpa or another character could have a visual task there which includes the whole family or maybe we could see Gil use the piano including the family of Grumples. Either way I think this would quickly become a favorite item of mine if it was introduced. As tappables of a Christmas event I think it would be great to see the Hobelves from Skinners Sense of Snow (S12, Ep8) seen in “The Christmas that Almost Wasn’t but then Was” – the film shown to the children by Skinner. We would be encouraged to tap on them to stop them from “ruining Christmas”. You can read this fun post by Bunny to read more on the Happy Little Elves that vanished after Winter 2014. And to end this list of Christmas content, I’d thought I’d mention another item that vanished with Winter 2014 … SANTA!!! Santa vanished to the Land of the Missing where he laughs daily with Lyle Lanley at annoyed tappers. But seriously EA … JUST. ADD. HIM. Christmas 2017 would be a great year if we finally got Santa as an unlockable full character. Story: After needing another source of income, Mr Burns decides to steal the sunblocker from the dump to block the sun and make an independent energy source that people would have to pay for – we’d get a Grinch Burns costume for this! After plunging the town into darkness Santa crash lands into Springfield after he lost control from the sudden darkness on a test run. Santa sees how miserable the townsfolk are in the Festive Season and decides to help the town regain Christmas cheer – This starts with a big Christmas Light turn on. 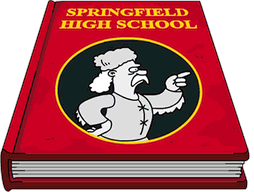 Every day (or every 2 days) Springfielders write a letter to Santa about what they want and what would make them happy. You have to help Santa earn a certain amount of Christmas cheer (from other options) and sometimes do other tasks (eg. Make Lisa go Shopping) to earn that item and some event currency. This would be instead of a 3 Act System. Examples include: Ralph wanting his mummy, Bart wanting permanent snow (snow tiles), Maggie wanting the Happy Little Elves, Rodd & Todd wanting an Alive Maude skin and the list could go on! 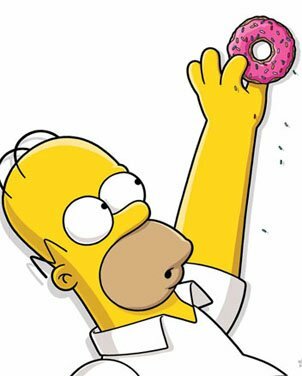 Gift Giving – giving presents to people definitly cheers people up so EA should encourage tappers to give to their neighbors (donuts, inventory items etc.) by rewarding them with Christmas Cheer/Event Currency. I really hope you enjoyed my ramble of a post and now feel in a festive mood, ready for whatever EA can throw at us (please let it not be Pagans 2!). All this post was speculation and ideas as NOTHING has been released by EA. Let me know what you thought of my ideas, any content you’d like to see for this Winter and Happy Tapping! Thanks, HappyTapper for a little Christmas Spirit…and big wishes for EA! (let’s hope they’re listening) What did you think of Sam’s post? Your thoughts on the holidays? Sound off below, you know we love hearing from you! 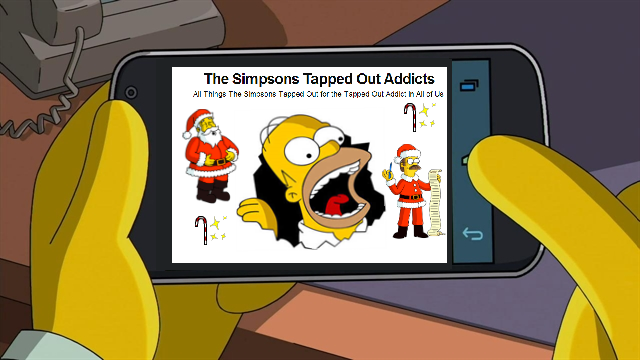 This entry was posted in From the Mouths of Addicts, Tapped Out and tagged Next Event in TSTO, Tapped Out Christmas Ideas, The Simpsons Tapped Out, TSTO Addicts, TSTO Christmas 2017, TSTO Tips and Tricks, TSTO Updates, TSTO Winter Event, TSTO Winter Ideas, What could we see for Christmas in TSTO. Bookmark the permalink. All. I want all of these ideas! They are great! Great article! I love your ideas! 100% you are the ideas but! Im sick of the 3 act updates (how long has it been and its all the same!!) I don’t do well in them and lose interest fast. The game has gone downhill fast since they started having constant themes/challenges. My first Christmas in the game was great and every year since then I have held my breath as the update runs and then been bitterly disappointed. It seems to get less Christmassy each year. I hope for a better back to the start Christmas and your ideas are great. EA!? Are you reading this???? Hire this guy, now! What a great post Sam! TY! So much Yes! Just went back and watched Kill Gil to refresh my memory. – I think Christmas building skins and night mode would go a long way to making some unhappy players whole again. – An outdoor skating rink to send Springfielders to? Yes!!! Snowball fights? Yes! Sounds awesome! Krusty’s Kristmas on Ice? All the Yasss! – The restored train for Marge? Love!!! You Forgot Me Nots? My SH promenade is probably getting a facelift this holiday. Im good with that. -You make the best argument yet for Gil as a full character. As for Santa and the full Grumple family, I’m ambivalent. I don’t have Homer driving the sleigh, I would like that option to come back. – The family characters. It’s complicated. Love the idea of Maude with ghost Maude as a skin. Ralph Christmas tree skin- yes please! 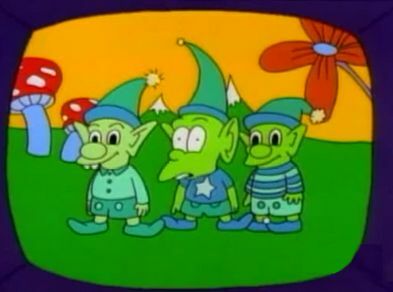 The Happy Elves? Fun! Every family member but possibly one? Sure! What is that one member pretty much every body but me wants? Sarah Wiggum. 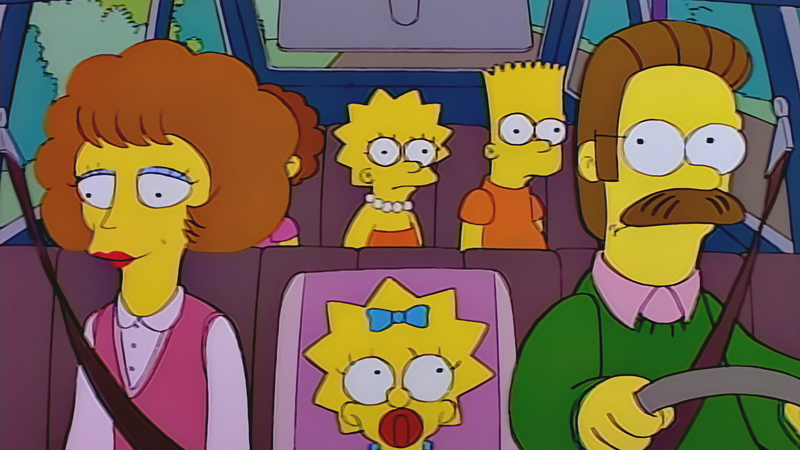 Hear me out- yes, Ralph needs a mom, she’s one of the few main characters still missing, I’m a Sarah and Ralph’s line of “That’s how mommy looks after a box of wine” is one of all all time favorite Simpson’s quotes. Here’s the thing. Think Tom Hanks in Castaway, where he leaves that one unopened package and that last package represents hope. As long as that last package is unopened, you haven’t yet jumped the shark. I love you Sarah, it’s ok with me if you stay underwraps. May we get what we wish for this Christmas, I’d love to be able to drop presents to my Neighboreenos. Got a Springfield feast going on if you want to drop by. Love to all our TSTO community, let’s spread it outward. Be Festive this time EA! All good ideas! I think a friend message system would help the gift idea. My #1 idea is a more relaxing and fun event. I don’t feel like grinding much at Christmas. Wow that is a long post. Who has the longest post so far? Is it still Safi, Patric or Sam? Hi Sam, They are all amazing ideas and very nicely written. I like your idea for a Christmas Event. Nice new pretty Christmas decorations. I would love a music box and when you tap it, it plays Christmas music. The same as your ‘Easter Egg’ idea, hidden items and clues as to where to find them. Perhaps the clues could be written as a Christmas song. Great post! I love these ideas. It would be fun to see them incorporated into the game. I want a real live ever green for xmas! A real live ever green this year! With candles all aglow to melt the fallen snow a tree for spreading xmas cheer! I want a real live ever green from Santa! With pine scent floating in the air! You see my xmas list has only this one wish a real live ever green this year! Give me a real live ever green this year! For TSTO fanfic this is pretty good stuff! Excellent! Very well thought out and hopefully will give EA some ideas. Nice one! Great post! Any of these events that you described would be something I would look forward to playing every day. Sam, an amazingly well-thought-out and comprehensive wish list! That was a lot of work, and is very much appreciated! I love some of your ideas…and frankly, it’s just about time for some of them!! When you have kids wandering the town for years as orphans, because their parents aren’t characters yet…well…that’s indefensible! What a great post! Thanks for the hard work.